There is no global cycling policy and globally cycling’s future will emerge from multiple and intersecting trends, including: responses to big planetary challenges such as climate change, the end of cheap oil, and the growth in diseases induced by sedentary lifestyles; patterns of car ownership and use, especially across the world’s fastest-growing economies; changes in cycling’s profile, particularly in globally iconic cities; and the possibilities of new technologies (including e-bikes and public bike schemes) to re-define current meanings and practices of mobility. But cycling’s future and so also the globe’s will be importantly shaped by its advocates’ views of what cycling is for. Why advocate cycling? Simply so it becomes easier for us as cyclists to move about by bike? Or is there a bigger vision of what everyone’s lives, relationships, places, and world should be and feel like? I think the latter – the bicycle is both symbolic of, and a pragmatic path to, another way of life, and this is why so many of us believe in cycling, and want to make it bigger. The bicycle isn’t yet the iconic vehicle to and of a brighter world, but it could and should be – there’s an empty space in the global imagination awaiting it to fill. Though the idea of the bicycle achieving globally iconic status might seem ridiculous, a hundred years ago the same might have been said about the car, and the bicycle’s deeply loved by people everywhere. If we want a different world organised around the bicycle not the car, it’s our business to make it. Cycling’s global future depends partly on how successfully its advocates build and sell cycling as core to a better world; and for that we need bold and powerful visions. Yet in Britain at least, no cycling advocacy organisation obviously and proudly struts an alternative global vision (the small, grassroots, activist-initiated Bicycology perhaps comes closest). CTC – the national cycling charity – endured the time of the car, and has (understandably) found ways of co-existing with it, though its recent ‘Cycletopia’ initiative seemed a tentative step in a more visionary direction. Sustrans gives tantalising glimpses of cycling as a route to a better world in its publicity material, but doesn’t really deliver more. A new organisation, the Cycling Embassy of Great Britain is less constrained, more impatient and ambitious, but has yet to develop a really compelling and inspiring vision of why transport cycling is worth fighting for. And although it’s become more common, even acceptable, to aim not for 2 but 25% of journeys by bike, it’s still unclear why. This absence of big and persuasive stories about why we want more cycling is a problem for two reasons. First, it means the value of cycling gets colonised by institutional agendas and ambitions. Institutions embracing cycling is no bad thing, but is it generating a bland, pragmatic and in the long-run counter-productive view of cycling? Is the dominant trope becoming of cycling fitting this world, rather than creating a route out, towards a better one? In projecting the idea that cycling belongs to the same world as today’s driving one, institutionalised cycling promotion prevents our getting somewhere else, cycling’s potential sold short and stymied. Second, it’s hard to motivate and inspire without a vision. As advocates we should help people cycling feel part of something big and transformative – a movement changing the world for good. Then they won’t be ‘merely’ cycling; they’ll be on a mission, and might get more involved. 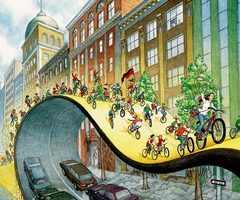 But the absence of global and national visions for cycling is felt locally – cycle campaigns everywhere struggle against a tide of indifference when they could and should be trail-blazing vibrant, radical and inspiring visions for their districts. At this local level, in Britain and elsewhere two styles of cycling advocacy tend to co-exist, often uneasily. In one, advocates view themselves as ‘cycling’s representatives’ and make suggestions for things that ought to be done (usually by others, mainly local government) for cycling, and complain about schemes (so many!) that fail to value cycling. Here, cycling is done to us, by those we lobby and to whom we protest; however much we love cycling, it becomes something given us by others. With respect to everyone who engages in such work (and I’ve done my share), such advocacy gets cycling a few crumbs from transport’s table and achieves little beyond reproducing itself as marginal; it’s jaded, lacks vision and disempowers both ourselves and others. The other style of cycling advocacy is more obviously vision-led. Cycling is not done to us, we do cycling. Although it rarely finds its way into mainstream cycle campaigning this style of advocacy can be found in grassroots projects, often workers’ co-ops, across the world; and it’s one to learn, adopt and adapt more widely. It’s time to reclaim cycling for a cause more noble than getting people to work on time, time for visions inspiring more people to ‘really get cycling’ (by which I mean not just doing cycling, but having reasons why, reasons dictated not by government policy priorities but real thirst for change). Cycling advocacy influences cycling’s future, and so too the globe’s, so we must be bold and visionary. Dream and demand too little and we’ll get less than cycling deserves – how depressing if more cycling doesn’t, when it so obviously could, change the world? So let’s work for a ‘cycling revolution’ which is no chimera, but real. This post is based on a talk I gave on 23rd October 2013, at the AGM of Dynamo, Lancaster and District’s Cycling Campaign. Thanks to Dynamo for having me speak, and to those who attended for stimulating discussion. The art work is by Mona Caron – whilst I’m sure not alone, she’s the only artist I know of who has done work that embodies a clear vision of cycling-based futures. This entry was posted on November 8, 2013 at 3:32 pm and is filed under CYCLING PROMOTION, CYCLING THINKING. You can follow any responses to this entry through the RSS 2.0 feed. You can leave a response, or trackback from your own site. Great article. I especially like the notion that populist cycling advocacy asks for crumbs from the government’s table, while some of us (who are less well represented within populist advocacy groups – probably because we don’t need advocacy so much to get what we need) choose to assert our rights rather than ask meekly for them to be ceded to us. One criticism: as a commuter cyclist, I don’t think getting to work on time is any less of a noble pursuit than any other goal of cycling advocacy. In my view it’s a lot more noble than the recreational cycling that most advocacy seems to use as its foundation. Not that there’s anything wrong with recreational cycling, but in my view it does tend to relegate the bike to the status of a toy in many people’s minds. Nice set of links too! I’ll be sure to spend a while checking those out. Thanks Ian. I’m very belatedly returning to and commenting on some of the responses to this article, which I neglected at the time. I don’t have a problem with commuter cycling, but I do have a problem with how commuter cycling can easily become what gets promoted (especially by institutional – and especially governmental – discourses), and it can therefore become ‘what cycling is’. So cycling becomes what is done by the ‘economically active’, and thereby itself a kind of economic activity. But what about everyone else? In the current talk about an urban cycling renaissance it sometimes feels to me like children, and older people, and all kinds of people who might want/need/like to cycle in the city for any number of reasons get ‘written out’, and forgotten. I’m surprised by this. Personally I’m feeling that commuter cycling and all other transport cycling (including children exploring their world and people just getting places) are in danger of being written out by sports/leisure cycling. Some leisure riders seem quite happy to throw the bikes on/in the car and drive out of the cities to the end of a decent route, while transport riders need routes that actually link homes with destinations. I’ll happily support leisure routes, but I wish more people would/could ride to them. Yes. I think it’d make an interesting investigation – what makes leisure and sport cycling so popular, whilst city cycling remains so repressed? What are the forces promoting sport and leisure cycling (role models? new enthusiasm for the Tour de France? Growing enthusiasm for active, outdoor leisure? the rural tourist industry?) and why do they seem to be more effective than the much more explicitly active forces (central and local government, big employers, cycle campaigns) trying to promote city cycling? Are leisure and sport cycling doing well because they are rural (even though rural residents aren’t cycling more but less), whilst commuter cycling is struggling because it is urban? Or is it more complicated than that? My point (I think!) was that most of the explicit institutional effort is put into boosting commuter cycling, but city cycling ought to be about much more than this. Rural cycling for leisure and pleasure and sport seems to be doing quite well without any help from Government, but this isn’t utility cycling. I agree with MJ Ray. To be honest, the idea that commuter cycling is what’s being promoted by cycling advocacy or by government strikes me as plain wrong, given the fact that very little focus (or money) seems to be spent improving road conditions or linking routes for commuters. If government has a strategy in all this, it seems to be focused on getting cyclists off the roads – i.e. pushing us out of the way so that the “real” road users (motorists) are not inconvenienced by us. As MJ Ray suggests, far too much money and attention seems to be focused on leisure trails that go nowhere useful for anyone that uses a bike on a daily basis. The sense I get is that commuter cyclists, far from being some kind of moneyed “economically active” elite, are working class folks and are viewed by some influential cycling advocates as filthy lower class proles. So I think you’ve got the whole thing upside-down in terms of who are the elites here. The elites aren’t the working stiffs who use a bike to commute. The elites are the folks who use a bike for vacations and who DON’T use a bike to commute. Also, I think you’re using the words “commute” and “work” too narrowly: work is not just stuff that generates a paycheck. It is what the vast majority of us have to do, whether we’re office workers, factory workers, stay-at-home dads or moms. Work can be getting the kids to school, grocery shopping, etc. – and many of us commute using a bike to do those things. My point, like yours, is that cycling advocacy should be focused on the day-to-day, not the summer vacation. The problem is, all too often, it’s focused on the latter. Thanks Ian. Interesting. I don’t disagree with you at all (even though I can see you disagree with me! ), which makes me wonder if there’s something important here – to do with tensions between the different assumptions and truths which we as differently located advocates are encouraged to adopt, do adopt, and then come to take as real. I agree that the promotion of urban cycling (which we are seeing (and advocates are spending a lot of time talking about) currently in the UK, especially in London) is largely a pretence, which keeps the minority of advocates ‘sweet’ whilst keeping the grip of the car very firmly in place – we are being duped, have been duped for a long time, and will continue to be duped. But I also think that, in the UK at least, policy-makers and advocates alike are talking mainly about city cycling, even though it’s cycling outside of the city which is getting people interested in cycling, and onto bikes. Is it doing it without help from government, though? I thought British Cycling (sport, £24m/year, income breakdown undisclosed) and Sustrans (leisure, £78m/year, 4% supporter donation funding) both got grants. I suspect governments see rural cycling as easier to support because it’s rarer that they’ll have to make the tough choices, like how to route multiple modes of transport safely through the same space. It’s also fairly easy to hand off some of those unpopular choices to Sustrans to decide (spend millions on a bridge or compromise the route? ), whereas in towns, highway authorities want to keep full control and wouldn’t dream of giving away the final say on junction design. Similarly, in urban areas, it’s safer to promote commuter cycling because commuters are on average fitter (they’re all fit enough to work) people who can and will muddle through the bodges because they need to get to work on time, rather than these pesky utility riders, some of who will stop, take photos and go out campaigning or turning up at council meetings (almost always on workdays!) asking for the worst abominations to be fixed. So I guess the upshot is that I agree that commuter cycling support is often a pretence. Does urban cycling get more of the focus because it’s the biggest problem not yet solved? A very interesting, and inspirational, post. I sense that many cycle campaigners, especially in urban environments, broadly share this view that cycling is one of the tools to move society forward and shift the paradigm on styles, or even the basic need for, personal mobility. There are others, probably myself included, living in more rural settings who are perhaps a little less ambitious, wanting rather to restore (?) the position where the motor car is our servant rather than vice versa, and is used only when alternatives are unviable, but can co-exist. A question – given that the arguments that “it’s good for the environment” or even the rather more specific and less contentious (to some eyes) argument that active travel is a vital tool to head off a health crisis are viewed as something of a turn-off in public advocacy, that you need to sell cycling at a more personal level ie its sped, convenience, or enjoyability for the individual, can such a visionary approach actually gain real traction? Or do we have to work with the culture we live in? So it’s based on a talk that you gave to a cycle nation member group, but you don’t mention cycle Nation? And British Cycling looks like the other big omission. Care to opine on how they’re doing and how to improve them? could this be part of the step change? We have too many cycle advocacy groups. I have done lots of voluntary work for Sustrans and am a CTC member. I would like to see these merge together with all the others so cycling can speak with one clear loud voice. As a start get this message out http://www.iarc.fr/ we are poisoning our children lets get cars and lorries out of our towns now. Well, the problem is, we don’t have one clear voice. While I’m all for getting motor vehicles off all our roads, some of us are quite happy to share the road with cars. Some of us spend more time in cars than on bikes – I doubt they’d be for removing cars from towns. Then there’s the question of so-called bike facilities – many are for them, some (including me) believe they increase danger to cyclists and weaken our right to the road. It’s no more realistic to expect One True Voice for people who ride bikes than it is for motorists. Motorists have the AA, CCC, CC, CSMA, IAM, MSA and RAC just off the top of my head. Each serves different interests, just like CycleNation, CTC, British Cycling, CTT, Sustrans and others do for cycling. The important thing is that we all pull in a similar direction and when we have different views, we work out compromises between us through things like the UKCA rather than confrontation in public. LOL! I guess you’ve never seen online forums where vehicular cyclists are held up for public scorn by those who call themselves cycling advocates. No, I’ve seen it, but I’ve not seen an officer of any of those organisations doing it: have you? I mean, I’m sure you can find random individual motoring advocates ridiculing other types of motorists. I seem to recall one Jeremy Clarkson being quite rude about Volvo drivers, for example. Why would anyone expect cyclists to be any more homogenous as a group? very interesting article… I’m getting further with research into visions of cycling advocates here in Australia and this fits well. 1. Australia has recently seen the birth of the Australian Cyclists Party to “get a seat at the table” – so to speak. Do you know if establishing a single interest party for cycling at a national level has occurred anywhere else in the world? 2. Did you end up producing a “Cycling Politics” edited collection after the 2010 Bicycle Politics Symposium and Workshop? I’m particularly interested in reading Aurora Trujillo’s work but would like to view the full set. I tried emailing this question but both of your email addresses from that site bounced. Apologies for the long delay in responding. I’m glad you found the article useful. 1. No, I’ve never heard of a single interest party for cycling before. Cycling has usually appealed to some political movements more than others, but to form a political party around it – well ….! Interesting. I’d be interested to hear how the Australian Cyclists Party gets on, and what the consensus is about it as a strategy. 2. No, unfortunately the Bicycle Politics collection ran to a halt. We got a good way down the path, but our favoured publisher was being quite strict (reasonably and understandably so) with what they wanted in and out of the collection, and in the end it felt like we as editors couldn’t – based on what we had – give them what they wanted. So it’s gone onto the ‘discarded project’ pile, I’m afraid. (A shame because there was some very good stuff there.) Aurora now works for London Cycling Campaign, so you could try contacting her there, to see whether she’s happy to send you her stuff (which is excellent). Hope things are good down under. Thanks Dave, sorry to hear the Bicycle Politics collection wound up. I managed to get a copy of Aurora’s work through Uni of Reading, thanks. Yes, a good read. Are things good downunder? In general, the permanent provocation continues. Our indigenous program is rolling along well. The inaugural Koori MTB Cup is scheduled for July. It’s coincidental that you featured the “Cycletopia” concept in this post… I’m currently researching such concepts with Uni of Newcastle, watch this space.